I have to admit it. The idea seems like magic. You take one of these handy Desolenators, add salt or brackish water and voila! Clean drinking water. Congratulations to the team who made the product on their successful Indiegogo campaign. But I have to point out (as an advocate of rainwater harvesting) that while desalination has its place in the pantheon of man-made clean water technologies, it doesn't hold a candle to the power of Rain. Cost: desalination is expensive. There is just no way around it. The Desolenator is coming out of the gate at $450 and while I wish them the best, it's a long road to the amount the BoP (bottom of the pyramid) can afford (they live on just a few $ per day). This is one of Paul Polak's major tenets- low cost at all cost. At RainSaucers, we have been experimenting with a $2 tank and rain collector that can be made locally. Logistics: with desalination, you still need a water supply. That means hauling water from the ocean or nearby water source. What good is clean drinking water when you still have to face the problems of assault (women fetching water) and missing school (children). Mother Nature provides rainwater right at your doorstep. Scale: both technologies can be scaled. Desalination plants already exist. But why aren't there more of them? Because it's much faster, simpler, and cheaper to build another reservoir (large scale RWH). 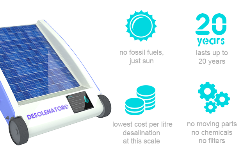 But at the household level, it means much less water for desalination-the desolenator only does 15 liters per day. RWH off a clean sheeted roof can generate tens of thousands of liters of water throughout the rainy season. To their credit, the Desolenator folks have added RWH capability to their system. So if it's raining, the user may not have to haul water after all. I also like the idea that it is a multipurpose device. Perhaps we should take a lesson from them and add some form of desalination technology to the RainSaucer. Food for thought.